You haven't told us which camera you are using, which is of relevance in a practical programme of learning. If you think that you have the eye for the shot, and want to take more control, there's merit doing it in stages, and learning what you can control creatively step by step. There is so much nonsense talked, mainly I think because a lot if people take the position that camera control is a sign of virility, hence the arguments about it. In the end it's all very simple. Stage 1 - move from fully automatic to 'A' mode (or Av on a Canon), and explore depth of field. DOF is another thing that people try to complicate to uselessness. The basic relationship is simple, the smaller the f-number, the less the DOF. By experiment and practice, you begin to get a feel for the DOF at different f-numbers, distances and focal lengths you get, and if you do have the eye for the shot, a feeling about when differential focus is going to add to the shot. If you're really trying to learn, then you can try the same shot at different f-numbers and see how the DOF changes and how that affects the impact of the shot. Generally, you also need to remember that the bigger the exposure ( that is, how much light is allowed onto the sensor, not how light or dark the final image is) the better the image quality will be, so you always want to keep the exposure as large as you can. 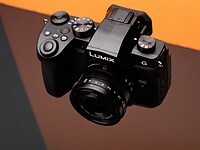 The way a conventional camera user interface works, his means keeping the ISO low (to find out what ISO is, read Richard Butler's recent editorial article on this site). In A mode, when you set an ISO and f-number, the camera will set the shutter speed to achieve the target exposure for that ISO. If you find that the shutter speed is being set too low for you to safely hand hold (there are some good rules of thumb for this, depending on your camera), then you'll need to raise the ISO. On some cameras auto-ISO can do this for you automatically. Stage 2 - explore motion blur. To do this you need to change to 'S' mode (or Tv on a Canon). Now you set the shutter so you can control motion blur. You lose control over the depth of field. Explore the creative possibilities of controlled motion blur and see how slow a shutter speed you can manage hand-held. Some considerations on ISO apply (only now the camera's adjusting the f-number). Stage 3 - move to M mode. Now you have direct control of both the DOF and motion blur. Remembering that the best exposure is the biggest exposure, but that you want to control DOF and motion blur, you set the f-number for the shallowest DOF (smallest f-number) that you can accept, and set the shutter as slow as you motion blur requirements will allow. Now set you ISO as low as it will go. Look at the meter display. If it shows overexposed (+) increase the shutter speed until the meter is centred. If it shows underexposed (-) increase the ISO until it is centred (again, on some cameras you can let auto-ISO do this for you, that makes it very simple). This technique will not absolutely optimise things, but it gets pretty close. Once you're getting results that you want, you can come back here and discuss the 'power user' techniques for absolutely optimising everything there is to optimise. One more tip. A lot of people, in my experience, will stress the absolute necessity of 'nailing' the 'correct' exposure. This is hogwash, which is lucky, since they will neither tell you what is 'correct' exposure nor how to 'nail' it. If you shoot in raw, so long as you don't overexpose and wash out the bright bits, you can adjust the final lightness of the scene exactly as you want during raw development, and you can do it at you leisure with a nice big computer screen for feedback. This is a much less random process than trying to use exposure by itself to set the brightness of the image.